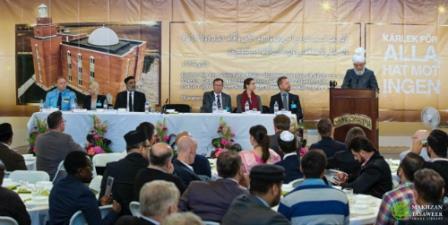 On 14 May 2016, the World Head of the Ahmadiyya Muslim Community, the Fifth Khalifa (Caliph), His Holiness, Hazrat Mirza Masroor Ahmad delivered the keynote address at a special reception held to mark the inauguration of the Mahmood Mosque (Mosque of the Praiseworthy) in Malmo, Sweden.The Mosque, which is the Ahmadiyya Muslim Community’s second Mosque in Sweden, was officially opened a day earlier when His Holiness delivered his weekly Friday Sermon. Over 80 dignitaries and guests, including the Malmo’s City Council Chairman attended the lunchtime reception. During his address, Hazrat Mirza Masroor Ahmad spoke in detail about the true purposes of a Mosque; he condemned all forms of terrorism and extremism and spoke about the humanitarian work being conducted by the Ahmadiyya Muslim Community in various parts of the world. “Some of the extremist Muslim groups have now also penetrated Europe and their members are living in these countries and posing a grave threat to the peace and well-being of this Continent. What they are doing has nothing to do with the true teachings of Islam and so all of us who desire peace must stand up and unite against these dark forces that seek to divide mankind.”In contrast, His Holiness said that Mosques built by the Ahmadiyya Muslim Community were true ‘Houses of Peace’ in which people gathered together to worship God Almighty. “A basic purpose of a Mosque is to serve as a place for Muslims to offer their prayers and in Arabic the word for prayer is ‘As-Salat’ which in essence means ‘compassion, love and mercy’. Consequently, a Muslim who offers his prayers with sincerity is a person who is kind, caring and merciful and he or she is a person who strives to stay away from immorality, illegal activity and all forms of evil.”His Holiness said that Ahmadi Muslims were committed to building Mosques throughout the world and that wherever they were built they were soon welcomed by the wider society. “We have built thousands of Mosques globally and we have always seen that the fears of the local people soon eradicate when they get to know us and they come to value, appreciate and welcome us as an integral part of the society. 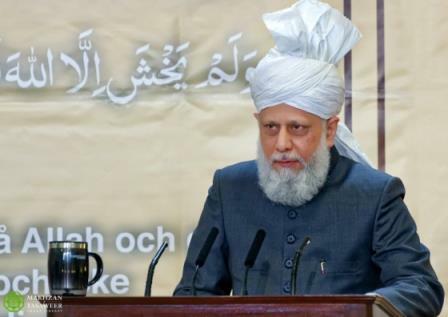 Any initial fears quickly dissipate and instead our neighbours come to cherish our presence and the message of peace that reverberates in all directions from our Mosques.” The Khalifa also mentioned how the Ahmadiyya Muslim Community was providing a range of humanitarian services, including healthcare and education to people living in the most deprived parts of the world.His Holiness said that all such services were provided irrespective of a person’s faith or background and also informed that the Ahmadiyya Muslim Community was engaged in projects aimed at providing running water to people living in destitution and poverty. Earlier in the evening a range of dignitaries also addressed the audience, including a welcome address by the National President of the Ahmadiyya Muslim Community in Sweden, Mr Mamoon-ur-Rashid. The event concluded with a silent prayer led by Hazrat Mirza Masroor Ahmad and later His Holiness personally met with the non-Ahmadi guests. 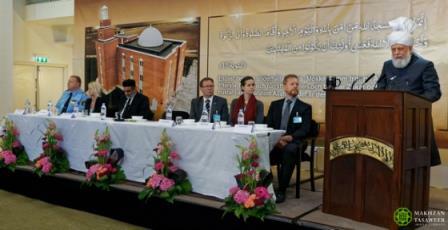 Share the post "Reception held to mark inauguration of Mahmood Mosque in Malmo, Sweden"